Parallel lines of cumulus clouds often appear when frigid, dry winds rush over comparatively warm bodies of water. NASA satellites have observed the striking cloud formations – which atmospheric scientists call “cloud streets” — over the Hudson Bay, Greenland Sea, Bering Sea, and the Amery Ice Shelf a number of times in the past. Recently, University of Wisconsin scientist Steve Ackerman was combing through data from NASA’s MODIS instrument as part of an effort to catalog and classify different cloud types. 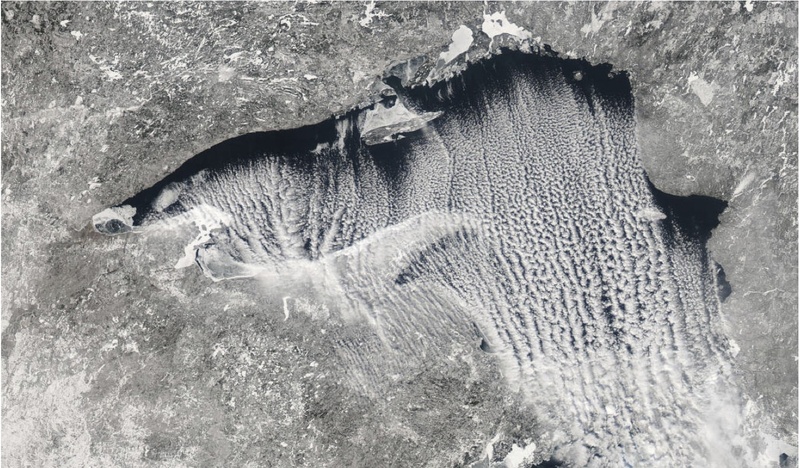 Something about the street clouds in this image of Lake Superior (above) struck him as peculiar. 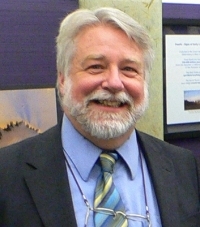 We caught up with him during a poster session at an American Geophysical Union meeting in San Francisco to find out more. WoE: What are we looking at here? Ackerman: These are cloud streets. They’re really quite interesting clouds. They occur when you get cold air blowing over warm water. You get them frequently over the Great Lakes and off the East Coast as well. WoE: What was it about this particular cloud street set that you found notable? Ackerman: We actually looked at a series of these, and what we found was that the clouds start small, grow in altitude, get thicker optically, and then do something quite strange and unexpected. Ackerman: Yes, often what happens is that the size of the cloud droplets grow as we’d expect at first, but then partway across the lake the size of the particles starts to decrease. Ackerman: Yes, we have no idea why they’d do that. They should be getting progressively bigger as they move across the lake and pick up moisture. WoE: About how big are these cloud droplets, and how do they change over time? Ackerman: They start off at about 5 microns. (For reference, human hair is about 100 microns.) They grow up to about 20 microns, and then they drop down to 10 microns. WoE: How long does that process take? WoE: Why do think it’s happening? Ackerman: We’re really not sure. Perhaps dry air is coming in from above. WoE: Is this the only time you’ve observed this phenomenon? Ackerman: It’s pretty rare. We found it in the MODIS imagery in the five years that we looked about 15 times. WoE: What makes a peculiar phenomenon like this worth studying? Ackerman: The next step is to work with cloud modelers and to see if they’re modeling things well enough to explain what’s going on. If the models can’t recreate unusual events like these cloud streets, we know they’re not getting things right. We need models to get the global climate right, and also the weather prediction right. The top image comes from the Moderate Resolution Imaging Spectroradiometer (MODIS). The other two images are courtesy of Steve Ackerman. Can NASA Satellites Monitor Radiation Plumes from the Fukushima Disaster? NASA is using multiple satellites and sensors to monitor the aftermath of the devastating earthquake and tsunami that rattled Japan on March 11. However, NASA’s Earth-observing satellites are unable to directly measure radiation-containing plumes, such as those experts fear may have wafted from a damaged Japanese nuclear plant in Fukushima prefecture. “NASA could fly a drone directly into a cloud to detect radioactivity, but it’s not easy to measure the damaging radiation from the Fukushima plant with a satellite. The radiation consists mostly of negatively charged electrons from so-called “beta decay” of radioactive products of the nuclear fission reactions, as well as positively charged alpha particles, which are identical to a helium nucleus (for example, two protons and two neutrons all bound together into a single particle). NASA does have detectors in space that measure such charged particles, but the great majority of these particles don’t come from Earth. Rather, they come from the sun, which emits a very large number of charged particles in what is called the “solar wind” — which is especially intense when the sun is active. The particles can also come from sources outside our solar system, so-called galactic cosmic rays, or GCRs, that become more detectable when the sun is less active. Fortunately, we humans down on Earth are protected from a lot of this particle radiation by Earth’s magnetic field, which steers charged particles along the field lines toward Earth’s magnetic poles, and thus acts as a shield for the human population. Trying to pick out the Fukushima radioactivity from the huge number of charged particles in outer space would be like finding the proverbial “needle in the haystack.” So, unfortunately, we have to rely on ground-based particle detectors, like the common Geiger counters that have been shown in use by the workers in their white hazmat suits in the tragic scenes in Japan. There is also high-energy gamma radiation, which is electromagnetic radiation. Again, NASA has had the Compton Gamma Ray Observatory (GRO) in space, and now has FERMI. But these look for extremely intense bursts of gamma radiation that come from colliding galaxies, quasars, and other extreme events in the universe. The low flux of gamma radiation from the nuclear power plant is all absorbed in the Earth’s atmosphere, and never makes it into space. The only way we might detect some gamma radiation from Earth’s surface would be if we created a gamma ray burst by detonating a large nuclear bomb. That kind of event cannot happen in a nuclear reactor, even in the worst case of a core meltdown. 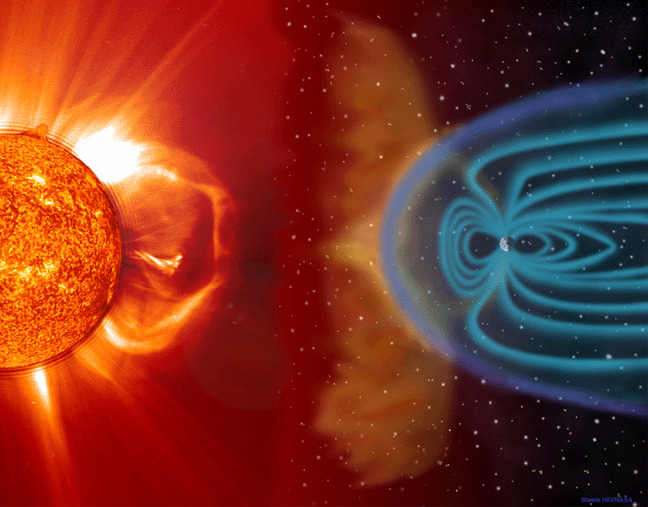 Visualization of solar wind and Earth’s magnetosphere courtesy of Steele Hill and NASA’s SOHO team. Visit this page for more information. Author avoilandPosted on March 25, 2011 March 8, 2013 Tags earthquakes, General, natural disasters, satellite research, tsunamis6 Comments on Can NASA Satellites Monitor Radiation Plumes from the Fukushima Disaster? NASA held a press conference about its soon-to-launch Glory satellite on January 20 in Washington, DC. The mission will advance understanding of the energy budget and climate change by taking critical measurements of aerosols and total solar irradiance. Want to learn more about Glory? Read an overview of the mission, view one of these two image galleries, brush up on aerosol science, take a look at this Q & A (pdf), follow along on Twitter, or browse the mission websites. Also, see what Nature, Discovery, and SpaceFlight Now have to say about Glory. Is Coagulation Geoengineering&apos;s Achilles&apos; Heel? 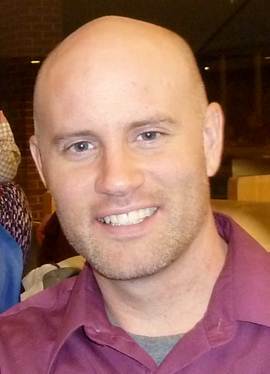 Jason English, a graduate student at the University of Colorado at Boulder and a participant in NASA’s Graduate School Researchers Program, chats with us about some of his recent research into geoengineering. WoE: Do you find there is a taboo of sorts against studying geoengineering among Earth scientists? It’s fairly unusual to see the topic come up at conferences, so your poster caught our eye. English: There is more acceptance of studying it in just the last couple of years. I think scientists are facing the reality that countries aren’t doing much to slow the emissions of greenhouse gases. Eventually, we may have to choose between the risks and consequences of climate change and the risks and consequences of climate engineering. The only way to make an educated decision about that is to study it. WoE: What type of geoengineering are you focusing on? English: For my PhD, I have been looking at stratospheric aerosols. WoE: Hold up. What are stratospheric aerosols? English: They’re the tiny particles that are aloft in the atmosphere about 20 kilometers above the surface of the Earth. One of the leading geoengineering ideas is to inject aerosols into the stratosphere. I decided, after getting help and input from colleagues such as Michael Mills and Brian Toon, to set up a computer model that would analyze exactly how something like that would work. 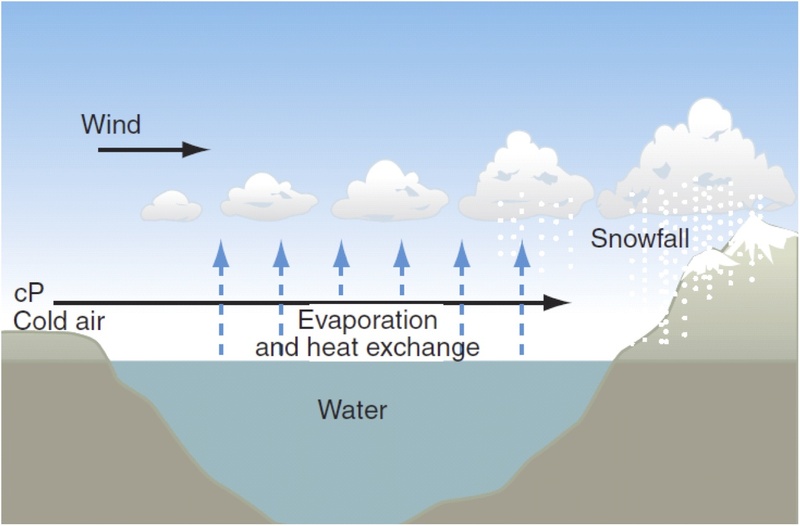 WoE: And what do stratospheric aerosols have to do with climate? English: People have suggested we could use a type of a particle for geoengineering that is actually composed of tiny droplets of sulfuric acid. Those are called sulfates. Sulfates reflect sunlight. If you have a layer of these particles up in the stratosphere they reflect part of the incoming solar radiation from the sun back to space. Overall, they have a cooling effect. WoE: And sulfates can make it all the way up to the stratosphere? English: Yes, some of the stronger volcanic eruptions can send particles into the stratosphere. They take a couple of years to settle back down to the surface. Very tiny amounts from power plants and other sources can also make it up that far. WoE: I get that you modeled what might happen if humans decided to inject sulfates into the stratosphere, but what was the precise question you set out to answer? English: There have been a few other scientists who have looked at geoengineering using stratospheric aerosols, but they didn’t simulate all the processes that can affect the particles. Recently, a team led by Patricia Heckendorn, a researcher based in Zurich, simulated all of these processes in a 2D model and found that the effectiveness of sulfate geoengineering diminished as more sulfate was added. I wanted to use a 3D model that looked at all of the processes, and I wanted to compare our results to Heckendorn’s. WoE: What processes did you include that others didn’t? English: For example, our model simulates coagulation, the process by which multiple particles can combine to become one. We also included nucleation – that’s when tiny gas molecules condense on each other to form liquid droplets. Also condensational growth. If you watch, say, water drops grow bigger and bigger on a piece of grass on a foggy morning you’re looking at condensational growth. WoE: What did you find when you included all of that in your model? English: What we found was that effective geoengineering required injecting larger masses of sulfuric acid than some have hoped because the particles coagulate and get much bigger than thought. Larger particles fall out of the stratosphere faster to the surface, so they’re not as effective at reflecting light. This matched Heckendorn’s results. WoE: How much less effective? English: It depends on how much sulfate we add. The more we add the less effective they become. English: It still gets more effective as you add more, but it has a diminishing return. We haven’t done a detailed assessment yet, but the group led by Heckendorn did, and they had a similar result. They found that you would need to inject more than 10 million metric tons of sulfur into the stratosphere per year if you wanted to offset the current forcing from greenhouse gases. People used to think it could be done with about 3 million metric tons. WoE: Ten million metric tons sure sounds like a lot. English: It is. Mount Pinatubo released about 10 million metric tons, but that was a one-time shot. Basically, we would need one or two Mount Pinatubo’s every single year. WoE: Where do we go from here? English: These results were surprising. If geoengineering is going to work, I think we’re realizing that scientists will need to look at new and creative ways to add particles to the stratosphere in such a way that they don’t grow too big and fall out too quickly. 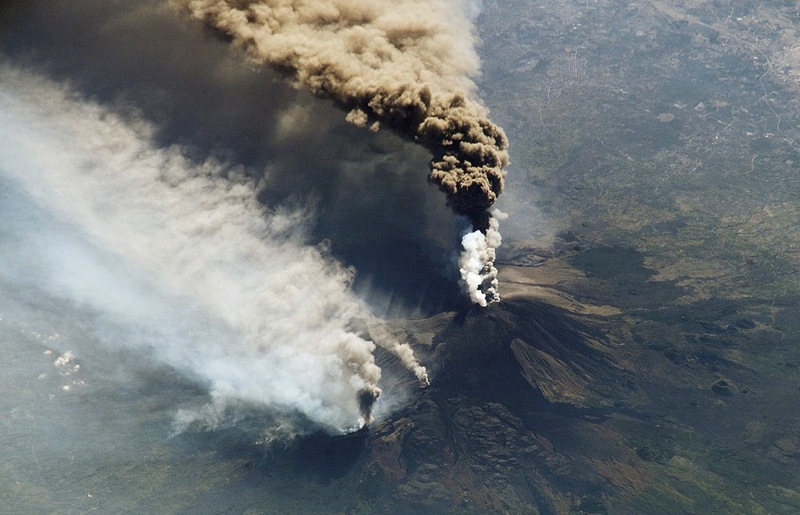 Image Information: Astronauts took this image of Mount Etna erupting in 2002. Credit: NASA/JSC/Gateway to Astronaut Photography. The lower image is courtesy of Jason English. Author avoilandPosted on March 3, 2011 March 8, 2013 Tags aerosols, atmosphere, climate, General, geoengineering10 Comments on Is Coagulation Geoengineering&apos;s Achilles&apos; Heel? “The way that we diagnose whether we have small aerosol particles, big aerosols particles, non-spherical particles, ice particles, cloud droplets is primarily using polarization. This is the most obvious and visually enticing example of polarization. 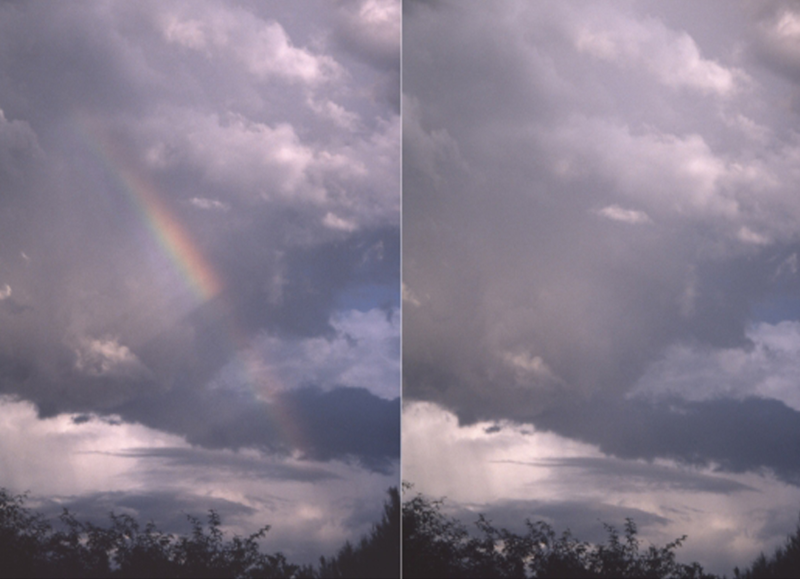 On the left, is a picture that shows a rainbow. A polarizer was used, so you can actually see that rainbow. On the right, there’s no rainbow because there was no polarizer. The reflected light is so bright you simply can’t see the rainbow without a polarizer. A combination of CALIPSO lidar data and CloudSat cloud radar reflectivity profiles are visualized over a greyscale MODIS infrared temperature image. 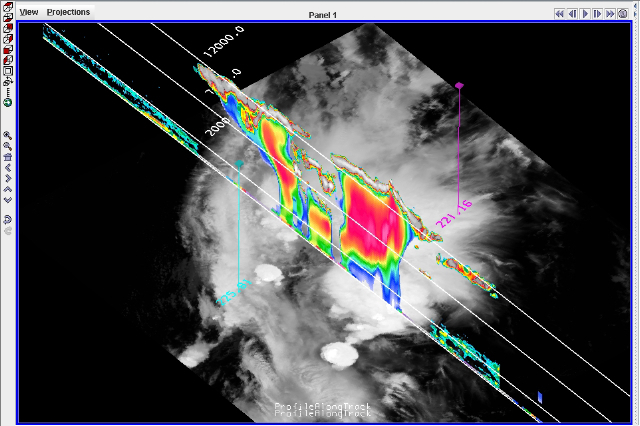 This McIDAS-V display illustrates the vertical structure of deep convective clouds and the corresponding cloud-top temperatures, allowing scientists to better integrate and understand the measurements from these three NASA instruments. Image courtesy of Kristopher Bedka. The latest version of a cutting-edge visualization program will help scientists at NASA Langley better understand what their observations are telling them about clouds and climate. The McIDAS-V software, developed by the University of Wisconsin-Madison Space Science and Engineering Center, allows users to merge large amounts of data from multiple instruments and different times and resolutions into integrated visualizations. The result is a fuller picture of what’s going on in the atmosphere. Satellites provide scientists with huge amounts of data everyday and organizing that data into digestible information has been a challenge. McIDAS-V will save scientists a lot of time and will allow them to look at their data in new ways. “Visually appealing images that would involve a scientist writing thousands of lines of code can be created in a few clicks of the mouse. The software also allows scientists to find potential issues in their products and fix them to produce more accurate data,” said Kristopher Bedka, NASA Langley Research Center representative to McIDAS advisory committee. At Langley, the software could be applied to projects including geostationary clouds and radiation products, cloud height measurements, real time weather observation data, ground-based weather radar observations, severe storm detection products, and observations from the NASA A-Train including MODIS, AIRS, CALIPSO and CloudSat. Using the software to look at data in new ways could help Langley scientists answer questions and solve problems related to the Earth’s climate like how clouds are changing and how they will affect Earth’s energy balance. The goal is to understand how Earth and its atmosphere interact and how changes will affect the climate. Using the new software, weather satellite imagery can be displayed including the fourth dimension, time, and data can be looked at in a global view. McIDAS-V can access remote and local data and it also allows collaboration between scientists through the sharing of portable data bundles. McIDAS software has been used in cloud retrieval work for the last 20 to 30 years. McIDAS-V is an update to an earlier version of the software, McIDAS-X. McIDAS-V has advances in data analysis and visualization in geophysical data in response to the increasing volume and complexity of geophysical data, increasing computer processing speed and memory, and new satellite instrumentation. Being able to view all this new data in diverse ways, means more possibility for advances in research about Earth’s weather and climate. McIDAS is a free resource available at the University of Wisconsin-Madison Space Science and Engineering Center Web site. What on Earth was that? It may have looked like an amoeba, but it’s actually a microscopic view of a wind-blown snowflake as viewed by a scanning electron microscope. Scientists in the Electron Microscopy Unit at the Beltsville Agricultural Research Center, which is just up the road from NASA’s Goddard Space Flight Center in Maryland, captured the image. Scientists at Goddard typically study snow from above using satellite instruments that fly high above the surface. Despite their differences, both perspectives offer views of bewildering beauty. 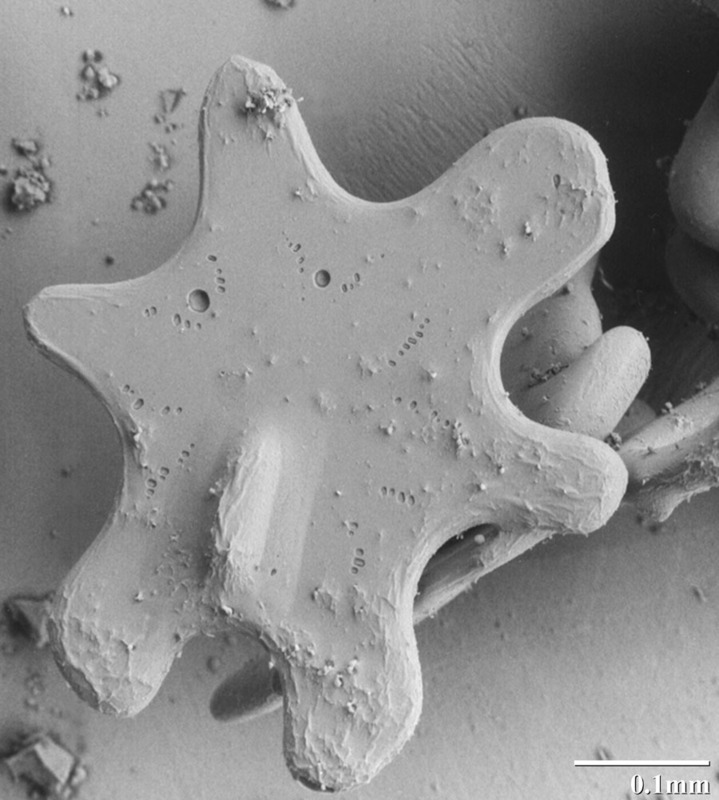 See more microscopic snow crystal imagery here. Satellite imagery courtesy of the NASA Earth Observatory. 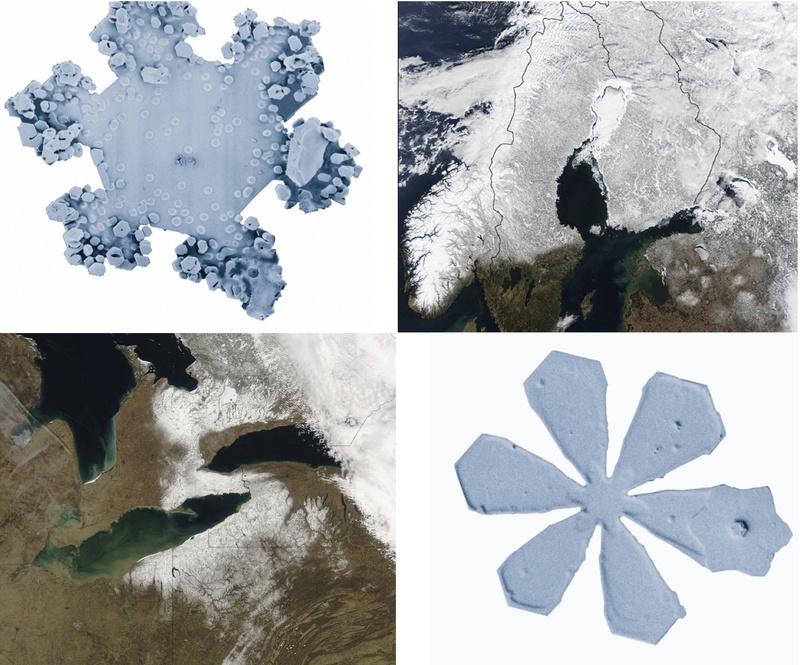 Snowflake imagery courtesy of the USDA. Arctic sea ice is retreating at an unexpectedly rapid pace. Average ice extent in September has declined by 11.5 percent per decade relative to the 1979 to 2000 average, according to satellite measurements of the ice. Many climatologists expect that the Arctic will be ice-free during the summer in as few as thirty years if current trends continue. Most scientists who study the issue closely agree that reducing carbon dioxide emissions is the key to stabilizing Earth’s climate. However, even if nations began curbing emissions immediately the world would continue to warm for many decades. While Earth can reabsorb some portion of carbon dioxide emissions fairly rapidly, a significant amount of carbon will remain in the atmosphere for long periods. Some 20 percent of carbon dioxide emissions are expected to remain in the atmosphere for tens of thousands of years, according to some estimates. That doesn’t bode well for the dwindling Arctic sea ice. 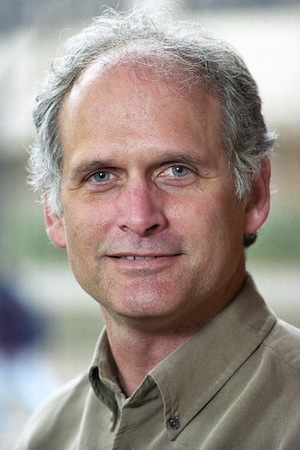 However, if Mark Jacobson, an atmospheric scientist from Stanford University is right, there may still be hope for Arctic sea ice and the ecosystem it supports. Jacobson studies the climate effects of tiny airborne particles called black carbon, a scientific term for soot, the black stuff in smoke. Wood, dried animal dung, and other biofuels all produce black carbon when burned. And fossil fuels, such as coal and petroleum, are especially prolific producers of the particles. Under a microscope, black carbon is an amorphously-shaped particle with a branching globular shape. What’s most notable about black carbon, however, is the many ways that it can warm the climate. Black carbon particles, which unsurprisingly tend to be a coal black color, warm the air directly by absorbing sunlight and converting it into infrared radiation. They also reduce the reflectivity of the surface when deposited on icy surfaces. And they infiltrate cloud droplets in ways that can cause clouds to dissipate more quickly than they otherwise might. Recent modeling, conducted by Jacobson and funded in-part by NASA, suggests that eliminating soot emissions from fossil fuel and biofuel burning over the next fifteen years could reduce Arctic warming by up to 1.7 °C (3 °F). Net warming in the Arctic, in comparison, has been about 2.5 °C (4.5 °F) over the last century.